Aimed at pony-mad children from 5-15, Ponies! magazine is a blend of activities and information for children both with and without their own ponies. It’s packed with fun and informative articles, quizzes, puzzles and things to do for all pony lovers, and there are loads of prizes to be won. 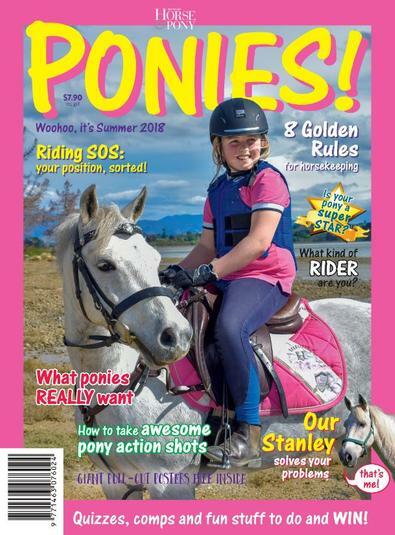 Features include fascinating pony breeds, how to make your pony a star, interviews with top NZ riders, and help for solving your pony problems. There are two big pull-out posters included free with each issue, and loads of ways that young readers can contribute and see their own artwork, photos and stories in print. I love Ponies Magazines. They are epic and great for learning more about horses! !